The Broadway Melody (1929): Dir. Harry Beaumont. Written by: Norman Houston and James Gleason, from a story by Edmund Goulding. Lyrics by Arthur Freed. Music by Nacio Herb Brown. Continuity by Sarah Y. Mason. Starring: Charles King, Anita Page, and Bessie Love. Rated G. Running time: 100 minutes. In its heyday, The Broadway Melody represented a real triumph of the “talkie” picture in terms of size, scope, and production. Nowadays it’s more notable for the path it paved for films like Singin’ in the Rain than for its own merits. The film attempts to translate the exuberance and heartbreak of the Broadway musicals to the big screen, to middling effect. Most of the story revolves around a vaudeville family pair called the Mahoney sisters (Queenie and Hank), who think they may have found an avenue into the competitive world of Broadway musical theater—Hank’s fiancee Eddie, a songwriter and performer. Soon Queenie is the talk of the town, much to Hank’s envious chagrin. To make matters worse, Eddie has fallen for Queenie after seeing her perform a statuesque. From here, the plot devolves into whiny and tiresome melodrama which may have been more interesting in a film that took itself more seriously. 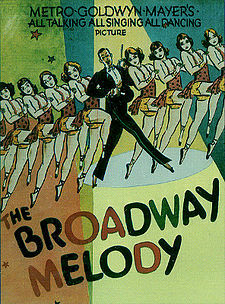 For a film entitled The Broadway Melody, one might be disappointed by the lack of musical numbers. What’s here is finely choreographed; one wonders if a musical revue may have been the better option for a film of this kind. As is, it’s not atrocious, but it’s much more tedious than we might expect of a movie musical.